Colorado Whitewater takes river safety seriously. We offer a variety of courses for our members that help them and their paddling partners safer on the river. While all outdoor recreation has inherent risks, many whitewater accidents are preventable. Here are some simple things YOU can do to stay safe. Wear your Life Jacket regardless of boat type or difficulty of water. A third of all whitewater accidents could have been prevented if the victim was wearing a life vest; many deaths occur in very easy rapids! Avoid alcohol and illegal drugs. Alcohol dulls reflexes and survival responses and is often linked to fatalities. Celebrate at your campsite or home. Know the river to prevent unpleasant surprises. Find out what lies downstream. Check the AW site, guidebooks, Google earth, and get advice from paddlers who have been there! Avoid extremes of weather and water: Very high flows and cold temperatures pose special challenges to paddlers. If you don't have the specialized gear and skills needed, wait until conditions improve. Avoid dams: Small low-head dams are responsible for over 8% of river fatalities. Most are much worse than they look! Know the location of dams before launching on a river, and avoid getting too close to the upstream or downstream sides of them. 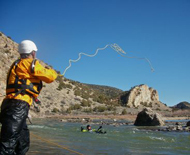 2019 ACA Swiftwater Rescue Clinics - Dates listed below. Somewhere, at sometime, you will wish you knew what to do in a river emergency. Just rescuing gear can turn into a nightmare, never mind rescuing a person. Quick response time and the knowledge to set up a rescue safely are skills you should have as a boater. Make this the year to bring your rescue skills to a higher level. Friends owe it to friends to be capable of river rescue. Kayakers must be of Class II-III ability. Rescue lifejackets are considered personal equipment and are highly recommended. This clinic qualifies as an ACA sanctioned course. Each year we add spring/summer session registrations starting in February/March. Please check back often or watch The Spray for announcements of when classes are available. If demand is high we may add more sessions as the season continues. If some unforeseen major event happens to prevent you from attending after you have registered, you may request a refund by contacting the Safety Director. Out of respect to RMOC, refund requests will not be considered within 10 days of the class. If cancelled 11 days before the first day of the event, the refund amount will be the cost of the event less processing fees. If cancelled less than 10 days, refunds are at the discretion of the Safety Director. 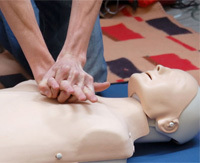 All Instructors, cruise leaders and sweeps are required to be Red Cross First Aid/CPR certified. As such, CW will again be providing free Red Cross First Aid/CPR certification classes for these volunteers! New for 2019, CW is also opening up this class to CW members, for a fee of $25 and will offer 2 different 1 evening sessions. Training meets OSHA Guidelines for First Aid Programs and combines lecture, interactive video demonstrations featuring emergency scenarios that are likely to occur in a variety of environments and hands-on training to teach participants lifesaving skills. Click here to register for the May 7, 2019 class. Click here to register for the May 8, 2019 class. We reserve the right to combine classes if participation is low, and will contact any registrants if we plan to consolidate. It is the responsibility of every club member to maintain this high standard of Whitewater Safety. CW firmly supports the AW Safety Code and strongly encourages all paddlers to adopt it. Information provided by Princeton University Outdoor Action Program on how to run a safe river trip and hypothermia & cold weather injuries.